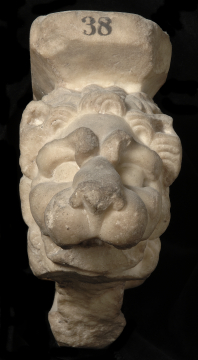 Fragment of the carved arm of a marble throne or top of a table support. You are here: CollectionsOnline / Fragment of the carved arm of a marble throne or top of a table support. 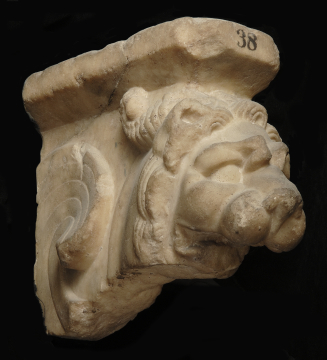 This fragment is probably the front end of the arm rest of a marble chair or throne, consisting of the arm support, and the head and part of the wings of a Chimera, which once formed the side of the seat. The Museo Archeologico, Florence, possesses a seated, headless statue of an elderly man - a Hellenistic philosopher figure - in a himation (not Aeschylus, but Epicurus on the throne of Apollo1); he sits on a solid, backed throne, the forelegs of which are relief sculptured in the form of a lion's head, leg, and foot as this Chimera and similar to many of the Soane table legs. The pendant "philosopher" ("Sophocles"2) who possesses a head, however, sits on a backless throne with the arm and leg details indicated only in a very general way. In speaking of the Ince Epicurus, Poulsen3 notes that the great interest in this statuary furniture and in variations of the protomai must be ascribed to the vogue of Graeco-Roman copyists. In Munich there is a Greek votive relief showing at the right a God or Hero enthroned in a chair of which arm rests and sides are carved in the shape of a Chimera similar to the type of side decoration of which this fragment once formed a part4. In Berlin a similar fragment5 is considered to have formed the head of a table support, such as no. 232; M24, but the only indication which would favour this here is the perhaps modern groove in the top. From the striking quality of craftsmanship and the marble, this fragment is first class late Hellenistic work of the early Empire at the latest. 1 L.A. Milani, Il R. Museo Archeologico di Firenze, storia e guida, 2 vols, Florence, 1912, II, p. 32, pl. CLVI, 2. 2 L.A. Milani, Il R. Museo Archeologico di Firenze, storia e guida, 2 vols, Florence, 1912, II, p. 32, pl. CLVI, 1. 3 P.F.S. Poulsen, Greek and Roman Portraits in English Country Houses, trans. Rev. G.C. Richards, Oxford, 1923, p. 43, no. 16. 4 S. Reinach, Répertoire de Reliefs Grecs et Romains, 3 vols, Paris, 1909-12, II, p. 75, fig. 1; cp. also the seat of the enthroned general on a well known triumphal sarcophagus in the Belvedere: W. Amelung, Die Skulpturen des Vaticanischen Museums, 2 vols, Berlin, 1903-08, II, no. 39, pl. 10. 5 Königliche Museen zu Berlin, Beschreibung der antiken Skulpturen, Berlin, 1891, p. 429, no. 1091. Rome; collected in Rome by Charles Heathcote Tatham for the architect Henry Holland during the 1790s. See Cornelius Vermeule, unpublished Catalogue of the Antiquities at Sir John Soane's Museum, Introduction, transcription of Tatham letters, List 2, no.45. Tatham: Drawings, 2, no. 45.